Hi, Globecanvas here. How about a five star ride that has everything? 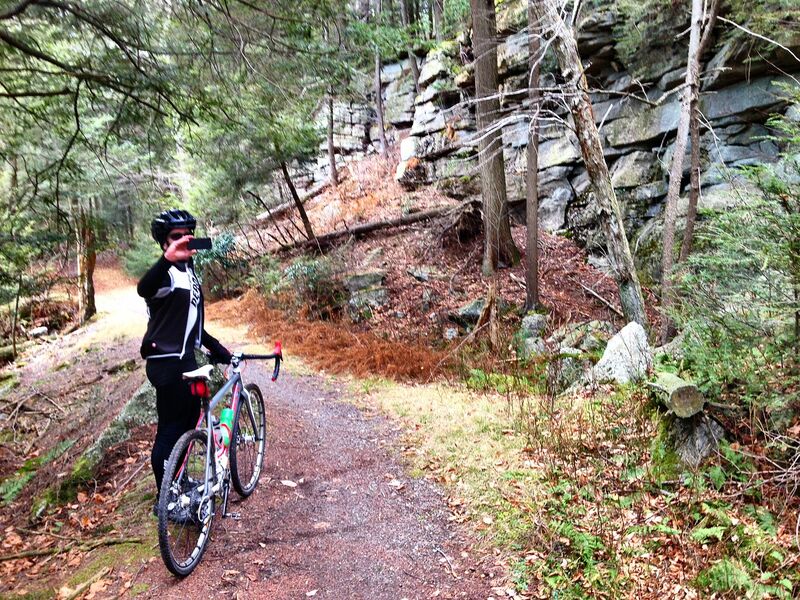 Scenic history, a huge gravel climb, woodsy grottos, sky lakes, clifftop vistas, waterfalls, winding carriage roads, horse farms, and seldom traveled country roads. I started today’s ride from the Bicycle Depot in New Paltz, because I was riding with Newman, and his cyclocross bike was there. Newman owns the shop, which I recommend highly for all of your bicycle needs, or for any beta you may need on local roads. 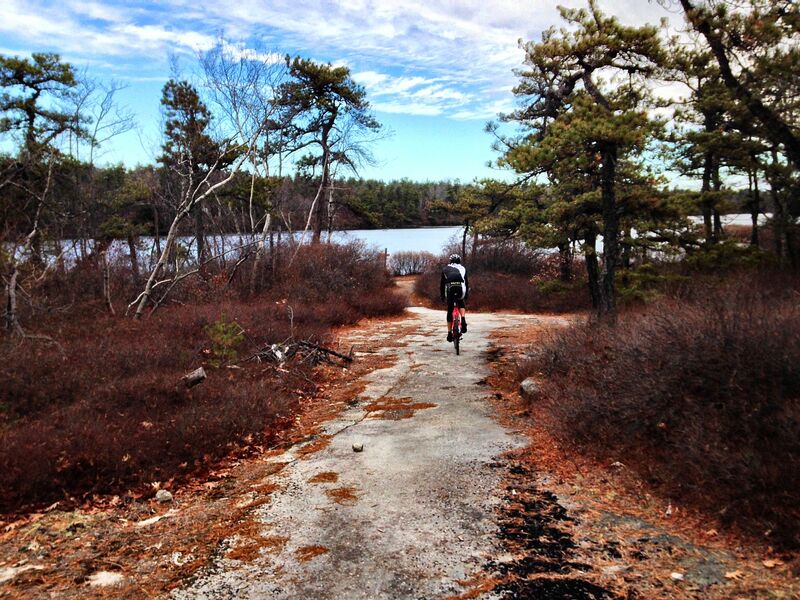 There isn’t a road within 100 miles that Newman hasn’t ridden. The first few miles out of town, heading toward the ridge, are highly exposed and the wind was whipping across the razed farm fields. 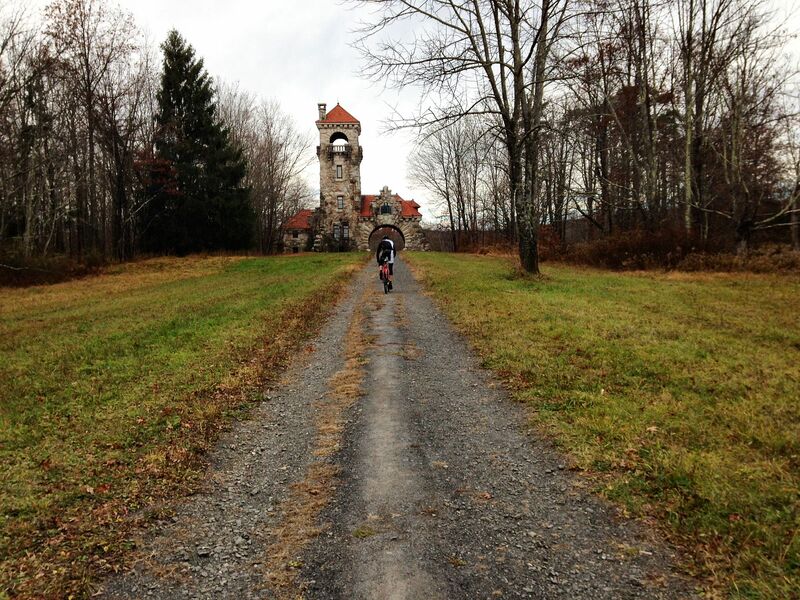 Once we pushed through that section, we couldn’t resist riding through the old Mohonk gatehouse. The Mohonk Mountain House is the last surviving mountain house resort from the glory days of the Catskills, a century ago. (Other jewels of the era, like the Overlook Mountain House in Woodstock or the Catskill Mountain House in Palenville, still exist as tourist curiosities — but they are either hollowed-out ruins or completely burned to the ground.) A hundred years ago, New York City society swells would ride their horse-drawn carriages through the gatehouse and up to the resort, three miles distant. The gatehouse and surrounding land are now owned by the Mohonk Preserve, which is in the process of converting the old gatehouse to a preserve entry point. The gatehouse, and the old gatehouse road, can’t be beat for scenic beauty. My photos of the gatehouse road today were blurry, but here’s a shot Newman took last week, on a sunnier day. From there, we rode down 299 to the Mountain Deli, the de facto meetup location for rock climbers before and after assaulting the Trapps. We also passed the Mountain Brauhaus, home of the best post-ride food and drink in the universe. Then we left the world of cars and wound our way along the base of the Near Trapps and Millbrook. 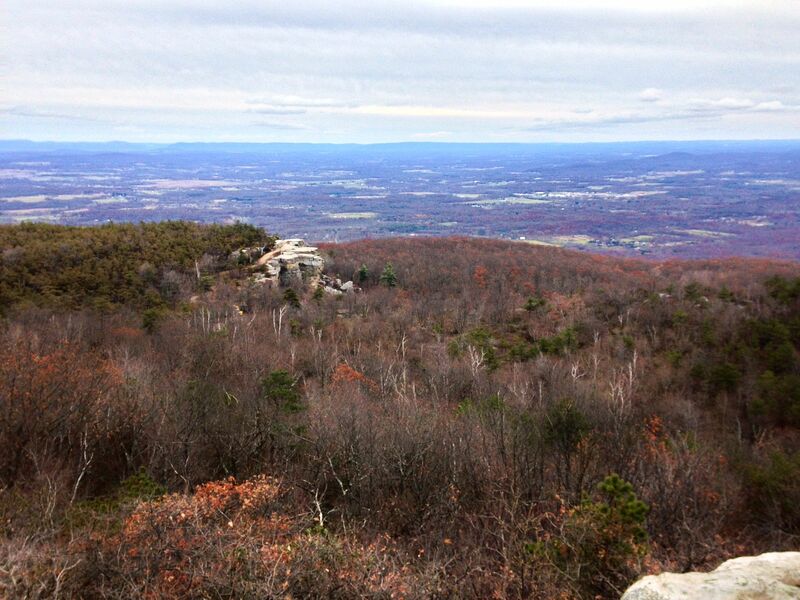 There are plenty of climbs in the Gunks and Catskills, but only a handful are inarguably in the top tier of difficulty — climbs like Platte Clove/Devil’s Kitchen, Sugarloaf, Meads Mountain. The Awosting Reserve climb, although much less well-known than the others, is firmly in the top tier. 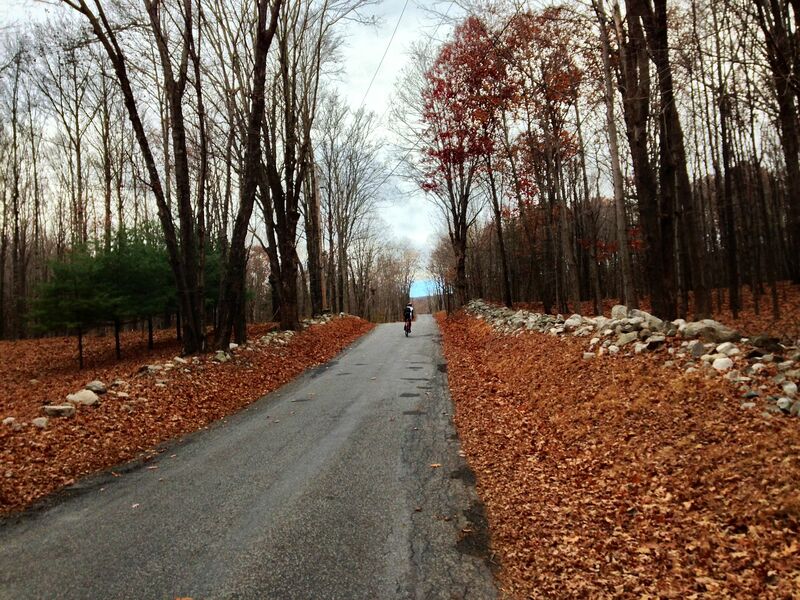 By the numbers, the climb is 2.1 miles at 9.5% average, which is followed by another mile at 6.5%. The climb is also 100% gravel and dirt. The Awosting Reserve trail head isn’t marked on Google Maps. 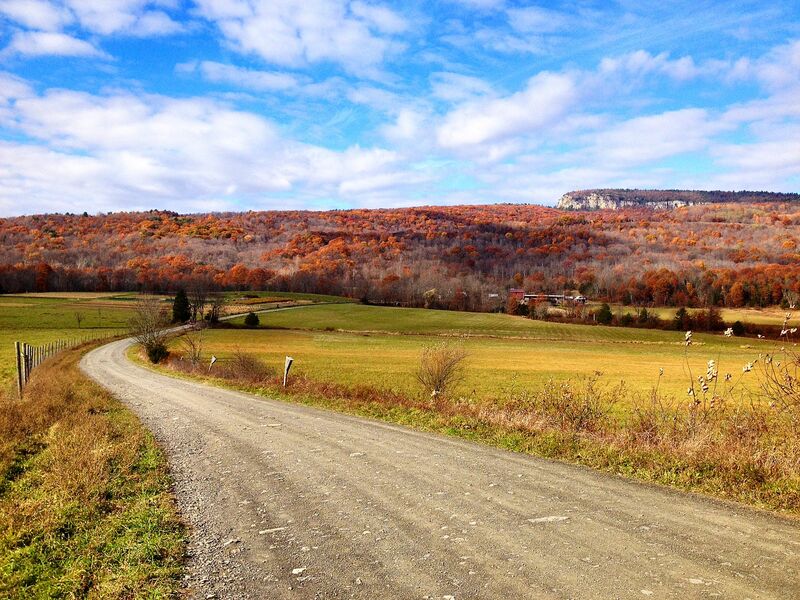 It’s off Aumick Road, below the Millbrook section of the Shawangunk ridge. Here’s a wide view of the climb (in blue). It climbs the ridge just southwest of the Millbrook crag (the sharp southeast-facing cliff on the terrain map). Looking at the crag from a distance, there is no pass or seam there. The climb just goes right up the ridge. 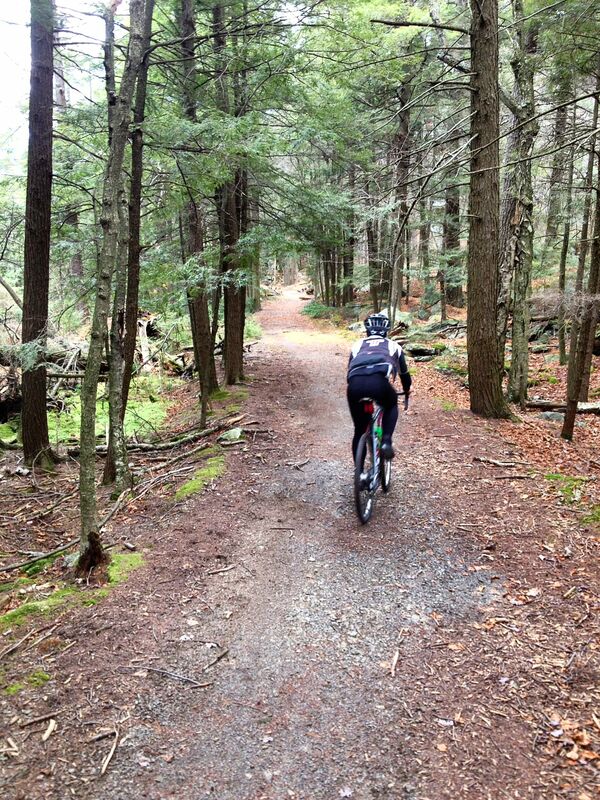 The first mile and a half of the climb is a well maintained carriage road, with big looping switchbacks. The grade is sustained but not brutal. There are a couple of false trails to the left and right through this section. At 1.5 miles from the trail head, the trail gets prettier, but things get ugly. The trail splits; take the sharp, steep right turn. The next half mile is sharp stairsteps, well over 20% grade, that will challenge your ability to keep the wheels down and gripping. This is still a carriage road, not singletrack, but thanks to the extreme grade it’s much rougher than the earlier part of the climb. 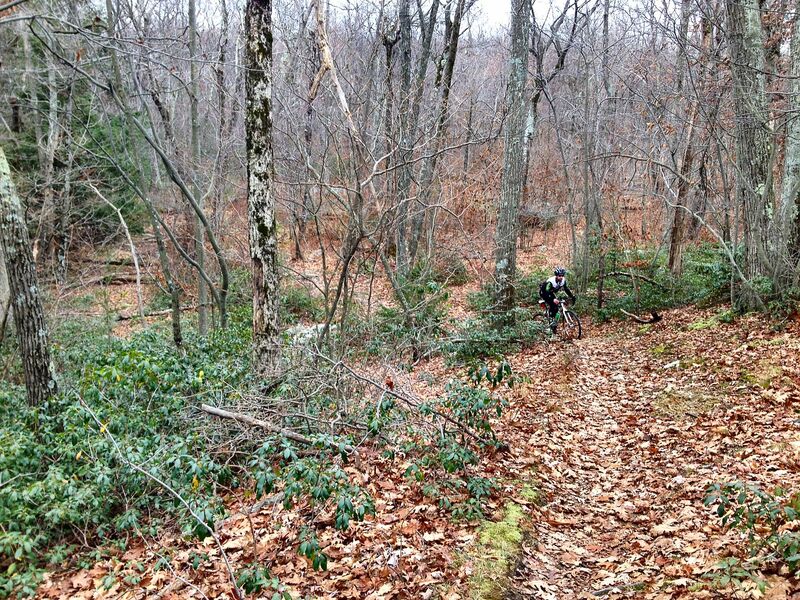 Newman easily outpaced me on this section, quickly disappearing up the hill. After 2.1 miles of sustained climbing, the trail mercifully turns downhill, but only briefly. Watch out for more false trails on both sides here — just keep going straight. At the bottom of the downhill section, a singletrack trail heads off to the right. A small wooden sign a short way down the trail marks it as Spruce Glen footpath. 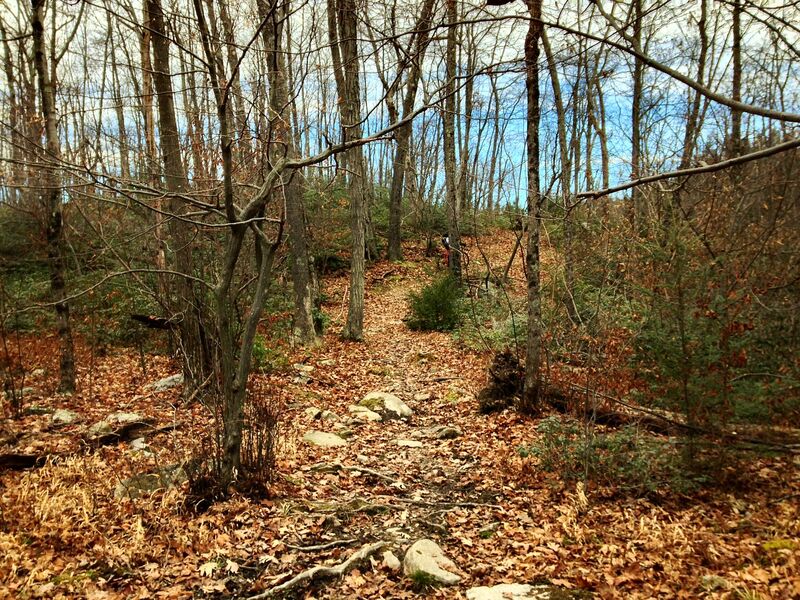 The singletrack is short and mostly rideable. 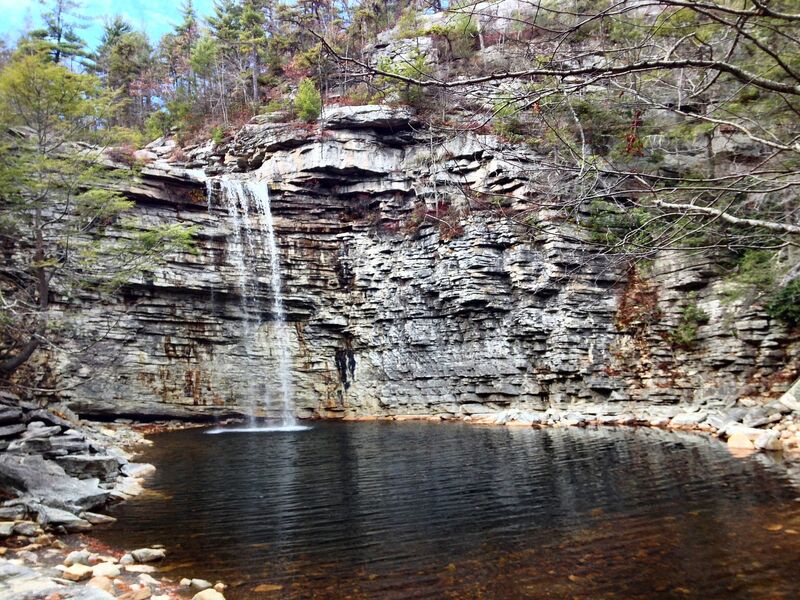 After a stream crossing, the trail widens into a gorgeous grotto of hemlocks and cliffs. We couldn’t stop taking photos here. It’s the sort of viewscape where you expect Mr. Tumnus to come prancing along. Another few hundred yards, and suddenly you’re at Lake Awosting, one of the Shawangunk sky lakes. Because the lake basin is formed by conglomerate bedrock, not dirt, it is very clear, but too acidic to support fish. Going right along the edge of the lake, the trail passes the lovely Awosting “beach”, an expanse of flat bedrock that angles into the lake. Take the next right hand turn to head up toward Castle Point. After about another mile of climbing, the trail summits at Castle Point. This is a world-class vista, and my humble snapshots can’t do it any sort of justice. Here is looking south, toward Hamilton Point. This is the high point of the ride in elevation. This is also where we realized we had a problem. 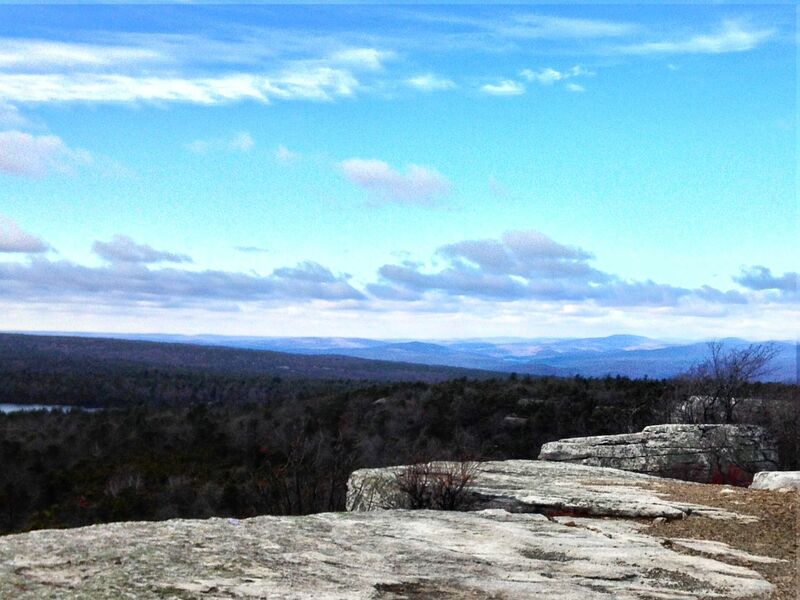 When we left New Paltz, temperatures were in the high 30s, and up to this point we had been climbing almost constantly, over 3000 feet in 18 miles. We were plenty warm, until we stopped to admire the view. Here at elevation, temperatures were in the 20s, and the wind was howling. There were patches of ice along the trail, and our bottles were frozen. We got cold fast, and we knew we had a good hour of descending ahead of us. We struggled into all of our previously shedded layers. 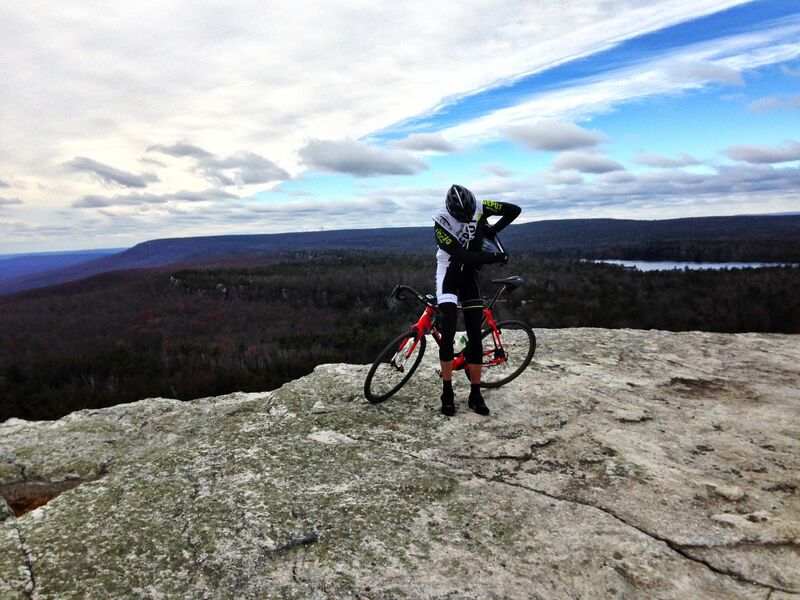 We rolled along the Castle Point carriage road, following the very edge of the cliff, toward Lake Minnewaska. This is a beautiful trail, but unforgiving of numb hands. We knew the trail well enough to descend at a good clip, but we had several discussions about how washing out on certain turns would leave you about a thousand feet below where you started. 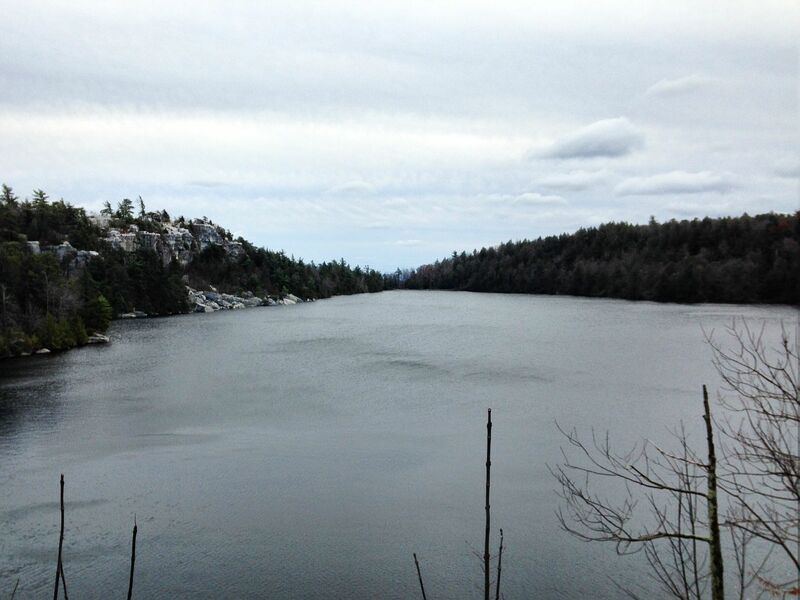 By the time we got to Lake Minnewaska, we had to stop to try to get some feeling back in our hands. From Lake Minnewaska, we followed the very fun switchbacky access road down to the park gatehouse, where we hopped onto the Awosting Falls carriage road, stopping at the falls to once again try to get some blood moving through our frozen hands. That would be the end of the photography, because it became impossible to operate my camera with what felt like frozen steaks attached to the ends of my arms. From the falls, the trail continues to descend gradually. 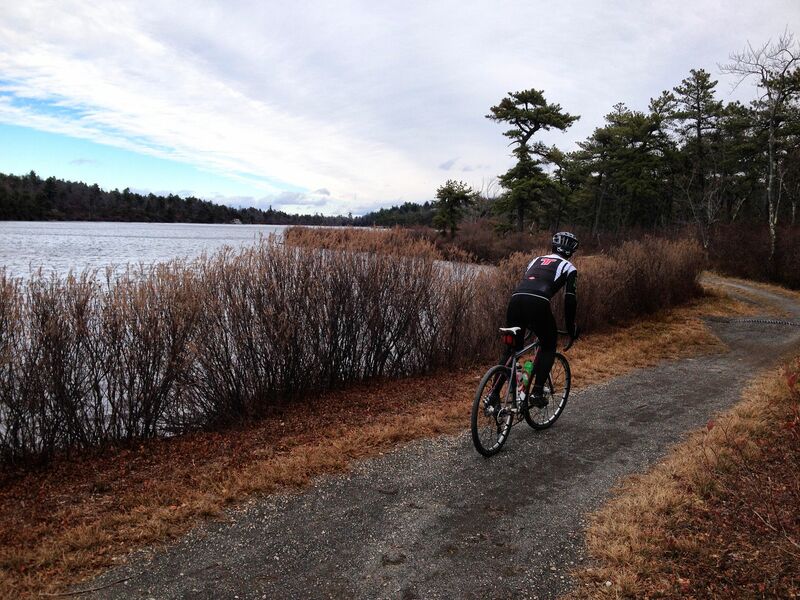 To keep from shivering, we had to ride hard enough to generate some body heat, but that also generated more headwind. I wouldn’t call it hammering, but we were moving along at a solid head-down tempo pace, after hours of climbing and then shivering. I had to shift by sight, because I couldn’t feel the levers. 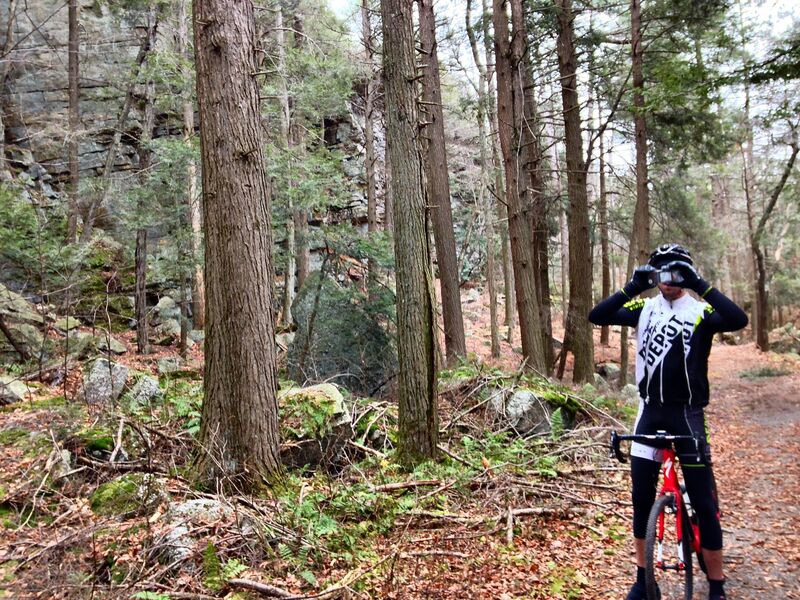 At the Trapps (no rock climbers today), we continued onto the Mohonk Preserve carriage roads. (The thought of descending at high speed on the paved road was deeply unappealing.) These carriage roads are some of the most beautiful cycling in the world, but you’ll just have to take my word for it today, because I didn’t have enough sensation in my fingers to unzip my vest, much less operate the camera. As we rode down Glory Hill and past Duck Pond, we finally gave back enough elevation that we started to warm up a bit, joke around and swap stories about previous adventures getting stuck out in the cold. We exited the preserve at Pine Road, said hi to the horses, and rolled the last 3 miles into New Paltz. I can’t recommend this route highly enough. If ever a ride was worth the trip, this one is. It has a little bit of everything unique that the area has to offer. The climb is very challenging, and the rewards are great. But, you know, layer up. For those who are not Stravafied, the raw GPX file is here. 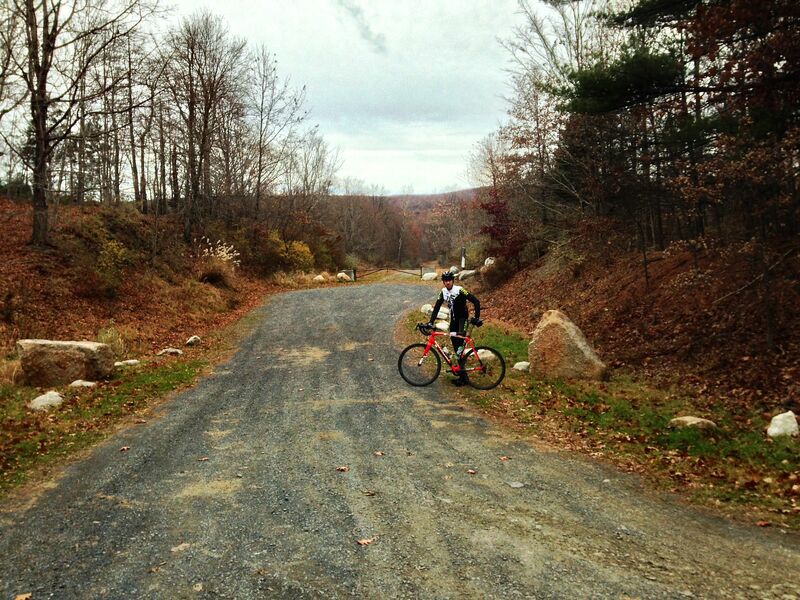 This entry was posted in bicycles routes rides, catskills, Worth the trip and tagged Awosting Reserve, carriage roads on November 13, 2013 by John Schwartz.